Info Don't let that spy get away! Busted! is one of Mona's microgames from WarioWare: Twisted! The player controls an unseen man carrying a spotlight. This man needs to point the light at a white-colored crook wearing shades while inside a dark alleyway. If the criminal is caught, he waves two white flags. If he is not captured, then the spotlight simply closes. 1st level difficulty: The crook walks at a moderate speed, trying to get away from the light. 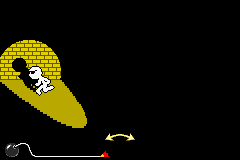 2nd level difficulty: The crook goes a little faster, and sometimes suddenly changes directions, attempting to throw the player off. 3rd level difficulty: The crook is outside of the spotlight at first, so the player needs to find him, usually on the edge of the screen. This page was last edited on September 19, 2018, at 20:55.